Wahl Organbuilders met special design and con-struction challenges for this project. The balcony in which the organ is installed is only 8-1/2’ tall, less than one inch higher than the casework crown. In addition to four ranks of upper work, into this compact case are installed a Pedal 16' and three Manual 8’s, with the Principal full length and open to low C. This is accomplished by combining casework, building frame, and pipes into one structure. The blower and bellows are also contained within the casework. 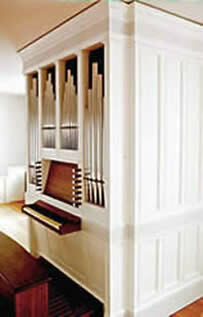 The instrument incorporates historic organ material in an effort to lower cost. The late Alan Miller Laufman was consultant to the Parish.